Nov 18, 2016 in "Disney Springs"
Disney Springs is celebrating Black Friday with big discounts at many of the Town Center, Marketplace, West Side and The Landing stores. 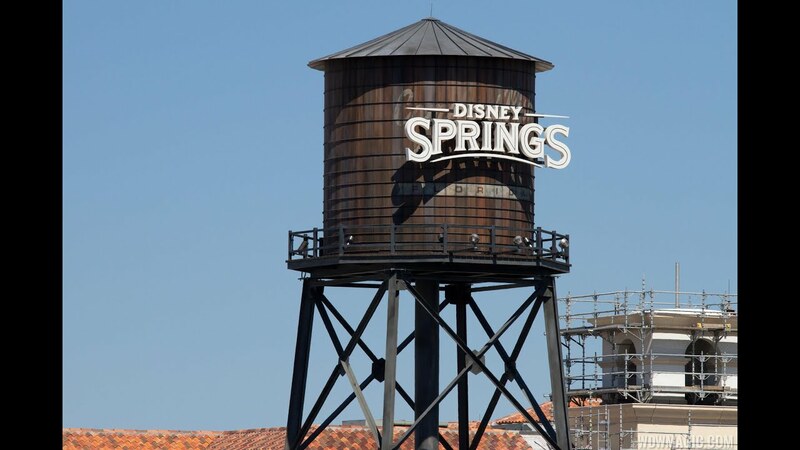 Disney Springs will open early on both November 25 and 26, with over 60 stores offering sales and promotions. Starbucks on the Westside will open at 7am, and Erin McKenna’s, Wolfgang Puck Express, Ghirardelli, Dockside Margaritas, The Daily Poutine, Marketplace Snacks, and the Disney Food Trucks will open at 8am. All stores will open at 8am on both days, with Disney bus transposition beginning at 7am. Here is a rundown of everything on offer so far. American Threads – First 50 Guests receive a FREE Piko sweater with a purchase of $75 or more (one per Guest while supplies last). Plus, get $20 off every purchase of $100 or more. Offers only valid November 25, 2016. APEX by Sunglasses Hut – Save 60% off original prices of select styles. Offer valid November 24 to November 28, 2016. Arribas Brothers – Receive free domestic shipping on purchases. Offer only valid November 25, 2016. Basin – Get one free bath bomb with any purchase over $50 and 3 free bath bombs on purchases over $100. Offers only valid November 25, 2016. Chapel Hats – Save 20% off entire store. Offer only valid November 25, 2016. Characters in Flight – Save $10 on tickets purchased before 10:00 AM (weather permitting). Cirque du Soleil Boutique – Save 50% off already discounted merchandise and 25% off ornaments and gift wrap. Offer only valid November 25 to November 26, 2016. Coca-Cola Store – Save 15% off purchases of $25-29.99; 20% off purchases of $30-34.99; 25% off purchases of $35 or more. Offer only valid November 25, 2016. Columbia Sportswear – Save 25% on select styles and brands. Offer only valid November 25 to November 26, 2016. Curl by Sammy Duvall – Save up to 40% off on select merchandise and gift-with- purchase items throughout the store. Dino-Store at T-REX – Get $10 off purchases of $50 or more and a free Build-A-Bear Workshop cinch with purchase of DINO Experience Bundle from 8:00 AM to 10:00 AM. Offers only valid November 25 to November 26, 2016. Edward Beiner – Save 25% off entire purchase. Not valid on Cartier and cannot be combined with any other offer. Offer only valid November 25 to November 26, 2016. Happy Hound Kiosk – Receive a free Bow Wow magnet with every $20 purchase. Offer only valid November 25 to November 26, 2016.
havaianas – Save 30% off sale merchandise. Offer only valid November 25 to November 26, 2016. House of Blues Gear Shop – Save 25% off regular price purchases before 1:00 PM and save $5 off $35 purchases. Offer only valid November 24 to November 25, 2016. Filthy Rich Kiosk – Save 20% off all jewelry. Offer only valid November 25 to November 26, 2016. Ghirardelli Chocolate and Ice Cream Shop – Between 7:00 AM and 9:00 AM, enjoy a free coffee with a $4.95 or more purchase. Plus, get a free Intense Dark Mango Bar with a $20 or more purchase or a free 100-count mini caramel bag and thermal bag with $60 or more purchase. Offers only valid November 25, 2016. Kipling – Save 25% off select purchases. Offer only valid November 23 to November 27, 2016. Fit2Run – First 10 Guests receive a free one-year membership to Club Fit2Run. Plus, enjoy special savings on select merchandise, including 50% off cold weather jackets and half zip ups and up to 70% off select sandals and running shoes. Offer only valid November 25 to November 26, 2016. Johnny Was – Save 25% off merchandise in the entire store. Johnston & Murphy – Save on men’s fashion and accessories, including up to 33% on select shoe styles, 40% off lowest ticketed price sweaters and up to 50% on select outerwear. Plus, all briefcases are $199.99; all scarves are buy one, get one free and all shirts and pants are buy one, get one half off. LACOSTE – Save 20% to 30% off select items throughout the store. Offer only valid November 25, 2016. Levi’s – Save 40% off entire purchase. Offer only valid November 24 to November 28, 2016. Lilly Pulitzer – Spend $75 and receive one pair of free earrings, spend $150 and receive a free necklace or spend $500 and receive a free jewelry box. Offer only valid November 24 to November 27, 2016. LittleMissMatched – Get 50% off apparel and an additional 25% off clearance items. Offer only valid November 24 to November 27, 2016. L’Occitance en Provence – Luxury travel set $18 (with $45 purchase). Plus, receive an “Ultimate Black Friday Gift” free with any $145 or more purchase. Offer only valid November 23 to November 27, 2016. Lucky Brand – Save 40% off purchases (excludes “rare finds”). Offer only valid November 24 to November 27, 2016. Luxury of Time by Diamonds International – Enjoy free battery changes for watches up to 30-meter water resistance and free jewelry cleaning. Plus, scope out deals on select pieces! Offers only valid November 25 to November 26, 2016. Melissa Shoes – Save 25% off all merchandise. Offer only valid November 25 to November 27, 2016. Origins – Scoop up Origins Superstar Sets for $65 ($130 value) and Origins Superstar Minis for $25 ($90 value). Available while supplies last. Offers only valid November 20 to November 25, 2016. Orlando Harley-Davidson – Stop by for great deals on select styles, including 30% off men’s styles and logo T-shirts for $49. Plus, get a $10 duffle bag with the purchase of 4 Orlando Harley-Davidson tees! Offer only valid November 20 to November 28, 2016. Pandora Jewelry – Receive a free bangle with a $125 purchase. Limitations apply. Offer only valid while supplies last November 25 to November 27, 2016. Pop Gallery – From 8:00 AM to noon, save 20% off all purchases over $150 and an additional 30 to 50% off select merchandise. Some exclusions apply. Offers only valid November 25 to November 26, 2016. Rainforest Café Retail Village – Enjoy $10 off purchases of $50 or more. Offer only valid November 25 to November 26, 2016. Savannah Bee Co. – Receive a free jar of Whipped Honey with Passion Fruit with every purchase! Plus, spend $35 or more and receive a free gift set. Sephora – Look for $10 deals throughout the store and limited-edition gift sets (exclusive to Sephora) for $25. Offers only valid November 25 to November 26, 2016. Shore – First 150 in-store Guests on November 25, 2016 will receive a secret savings percentage (between 10% and 30%) off their purchase. Plus, on November 25 and November 26, 2016, receive a free gift with a purchase of $300 or more. Sound Lion – Save 15% off entire store. Offer only valid November 25 to November 26, 2016. Sugarboo & Co. – Get 10% off purchases of $100-$199, 15% off purchases of $200-$299 and 20% off purchases $300 or more (discount applied to total purchase). Offers only valid November 25, 2016. Sunglass Icon – Save 60% off original prices of select styles. Offer only valid November 24 to November 28, 2016. Superdry – Buy 2 items, get 1 item free. Offer only valid November 25, 2016. The LEGO® Store – Save up to 50% off while supplies last—offer valid only on November 25, 2016. Plus, get an exclusive snow globe with a $95 purchase—offer only valid November 25 to November 28, 2016. Tommy Bahama – Limited time “Flip Side” offer: Receive a $50 award for every $150 you spend in store to use toward a future purchase. Offer only valid November 23 to November 28, 2016. Additional restrictions apply; see store for details. TROPHY ROOM – Save 23% off select merchandise. Offer only valid November 25 to November 27, 2016. TUMI – Save 25 to 40% off select collections. Offer only valid November 16 to November 27, 2016. UGG – Save 30% off select women’s, men’s and kid’s styles. Offer only valid November 25 to November 27, 2016. UNDER ARMOUR BRAND HOUSE – Get $25 off every $150 purchase until 11:00 AM—offer only valid November 25, 2016. Plus, get 25% select fleece jackets—offer only valid November 24 to November 28, 2016. UNOde50 – Save 30% off all styles. Offer only valid November 25 to November 28, 2016. Vince Camuto – Save 40% off entire purchase. Offer only valid November 26 to November 27, 2016. United World Soccer – Save 50% off select jerseys. Volcom – Save 40% off all Volcom brand merchandise. Offer only valid November 24 to November 25, 2016. Disney will sell a a Vera Bradley “Midnight with Mickey” hipster bag for $24.99 at Marketplace Co-Op, Storm Trooper Action Figures for $14.99 at Star Wars Galactic Outpost, and a holiday wreath with lights for $16.99 at Disney’s Days of Christmas. More to be announced. All discounts and offers subject to change without notice.